I have very fond childhood memories of fabulous meals around an overloaded Thanksgiving table in our middle-class dining room in Southern and then Northern California. The most vivid memories include the round cut-crystal dish with a bottom surface that sparkled like a thousand real diamonds that nestled the log-shaped cranberry sauce — fresh from the can, of course; the candy-sweet and scrumptious yams with their marshmallow pillow top that for the kids at the table hid any resemblance to a vegetable; the longtime family recipe turkey dressing that was also turkey stuffing in our house, a three-day concoction of creamy cooked potatoes, stale white bread, whole milk, grated yellow onions, salt, and lots of dried Summer Savory. And dessert? Well, Mom was the Betty Crocker of the neighborhood, so even when it was just the four of us for Thanksgiving – Mom, Dad, my sister and I — mince, pumpkin, and apple pies decorated the dessert table, their collective aromas teasing our taste buds into saving room for the best part of the meal. Once the turkey had been dismembered and relished, and its remaining juicy meat safely tucked away in the refrigerator for tomorrow’s sandwiches, my father always carefully extracted the wishbone from the big bird, delicately placing it on the kitchen windowsill to dry out for a few days. The wishbone represented the magical world of dreams and their chasers, like when you find a penny on the sidewalk and put it in your left shoe for good luck. You either believe or you don’t. We did. I still do. But it was a long few days of watching and waiting, of thinking and planning. Dad’s wishbone had to reach the critical point; don’t touch it before that, he would warn, it needs time to wither in the sunlight on the sill in order to be completely dry and therefore more apt to give way to the tugging of small, eager hands in search of a lofty wish come true. His no-touching rule allowed me sufficient time to gather my wishes, tossed together like a big bowl of leftover Halloween candy. Which one will it be this time, I’d wonder, mentally sorting through the magical possibilities in my youthful brain. Too young to even think to wish for fame and fortune – if only I had those opportunities back! – I’m sure I usually wished for something like a new Barbie or bike for Christmas, or a family vacation to Disneyland. The wishbone on my windowsill today is from a classic roasted whole chicken that I recently bedded down with celery, onions and carrots, much like I would a pot roast of beef, being careful not to overcrowd the buttered and seasoned bird. Though not from a Thanksgiving turkey, my small chicken wishbone still represents the wishes of my past as much as the wishes of my future. It is, after all, about magic and tradition, and is an homage to my father and his endearing childlike ability to make me believe that wishes do indeed come true. Besides, I could use a little bit of magic right about now. Several months ago, I suddenly lost my job after 19 years with the same company. The experience was like a chair being pulled out from under me as I prepared my body to sit. It was as jolting as it sounds, not to my posterior but to my rapidly decreasing level of confidence. I am 55 years old and worlds apart from the college graduates who will now sit beside me in Human Resources waiting rooms. Each day I frantically give chase to my fleeing sense of value in the world. Who am I anyway? Am I my resume´? The lyrics from the Broadway hit, A Chorus Line, resonate over and over inside me like a churning pot of bubbling cream begging to be pulled from the heat. Perhaps the only thing I know for sure at this point is that I am a writer who likes to get creative in the kitchen. And I am a dreamer. If keeping the wishbone tradition alive is a shout-out to Dad, then my nagging urge to play in the kitchen is a low, slow, royal curtsy to my mother, who believed in the healing powers of cooking and baking for others. It is with her in mind that I begin this blog to reinvent my life while revisiting the recipes and food memories of my youth. I didn’t quite realize it before she was gone, but the hours she spent in her well-worn kitchen weren’t merely about putting food on the table. They were about moments of love and laughter and life; about the fine art of relishing a happy memory as much as you would a bite of something deliciously decadent as it rolled around in your mouth, danced a bit with your taste buds, and slid down your throat. You want it to linger and visit, to carry over until the next moment of sweet satisfaction. This is my journey of getting from here to there – wherever there may be. It is a journey of discovery and reinvention. Kindred spirits adrift on the same swelling sea: if you’re out there, chime in. Together we’ll remake ourselves and soothe our souls. This is our ship of second chances and it has many open seats. And like any good cruise, the accent will be on the food. I absolutely love, love, love chicken. I could eat chicken every day – and some weeks I do! It is one of the most versatile foods on the planet, and can be tweaked to satisfy the pickiest of eaters. It easily fits into most any cultural category and is readily available in several forms – light meat, dark meat, whole, ground, the grab & go (drumstick) – making it a dinner party host’s dream come true. One 4-5 lb. whole chicken; giblets removed; thoroughly rinsed inside and out; patted dry. Preheat oven to 400 degrees. Sprinkle inside of rinsed chicken generously with salt and pepper and place in a large glass or ceramic roasting dish. Tuck ends of wings underneath the body of the chicken so they won’t burn. Place three lemon quarters and two eighths of the onion inside the cavity of the chicken. Place the thyme, parsley, and one tablespoon of butter inside the chicken with the lemon and onion. With your fingers, loosen the skin away from the breast meat, being careful not to tear the skin. Rub a tablespoon of butter under the skin of each breast, and place a couple of sage leaves under the skin of the breasts; make sure to smooth back the skin to cover the breast meat as much as possible. With the remaining butter (and all that is already stuck to your fingers) grease up that bird. Massage the outside of the chicken completely, around the legs, thighs, and over the breasts until the bird is buttered nicely and your hands are a mess. Using the kitchen string, truss the drumsticks in together to ensure even cooking. Place carrots, celery, and remaining onion pieces around the bird, and sprinkle the veggies and the outside of the bird with salt and pepper. Using the reserved lemon quarter, squeeze a bit of lemon juice over the bird. 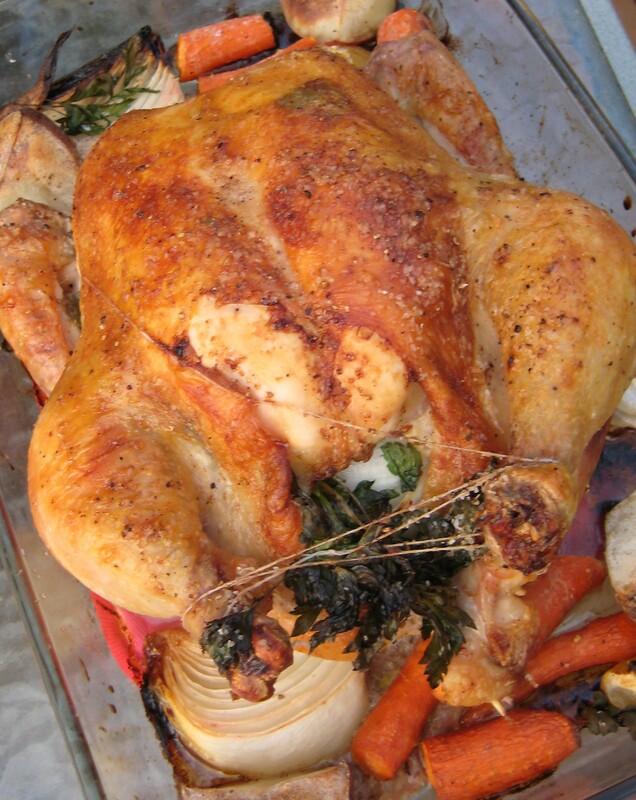 Roast for approximately 75 minutes to 90 minutes – depending on the performance of your oven and the size of the bird. (My convection oven cooks at a faster pace than my conventional oven.) Test doneness by inserting the tip of a knife blade between the drumstick and the body of the bird to release the juices: If the juices run clear, it is done; if the juices are pink, it is not ready for consumption. When the chicken is done, remove from oven, lightly cover with foil, and allow to rest for at least 15 minutes before carving and serving. Enjoy! This entry was posted in Chicken / Poultry, Comfort Food -- Savory, Entrees and tagged chicken, comfort-food, reinvention, roasting, Thanksgiving, turkey, windowsill, wishbone. Bookmark the permalink. I never knew anyone but me dried out the Thanksgiving turkey wishbone!! Mine gets a red ribbon bow & hangs on the Christmas tree! I started this tradition in my family and have passed it to my children & grandchildren. You are a gifted writer. I closed my eyes for a second & I could smell your Mama’s pies! Thank you, Debbie! 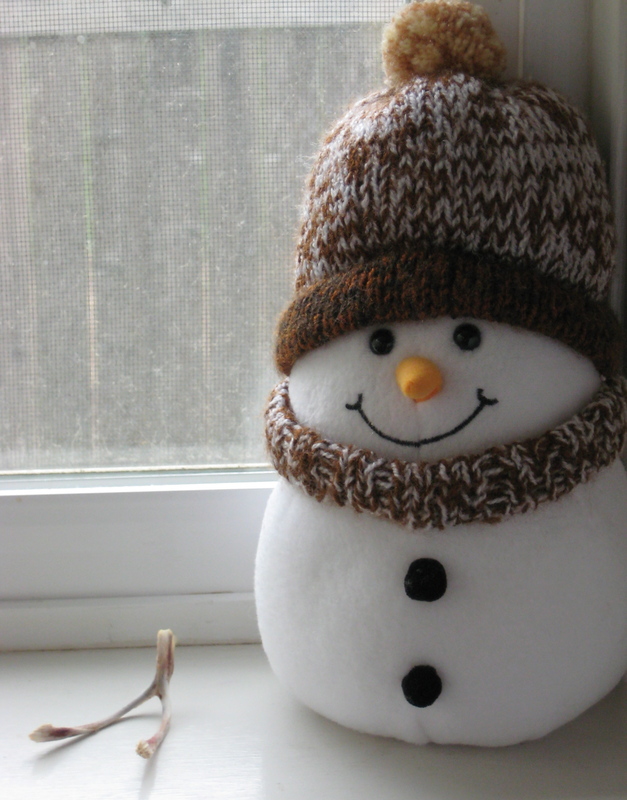 I love the wishbone tradition; maybe I’ll try it on the tree this year, too! BRAVO MISSY You really have a gift. Good luck in your adventure and I will check in regularly. Love to have new recipes to try. Your pictures are a great idea. I am so proud of you. Has Food Network contacted you yet? Keep up the great work! So glad to know you’ll be checking in often — thanks so much, Lainy K. I’m hanging by the phone in case Food Network calls. How wonderful your musings. LOVE IT! Your ability to describe in detail our ‘collective’ shared experiences in our youth is remarkable. In our family, we ALWAYS (and, I still do too) dried out the wishbone for days. Being one of five kids, it was usually a battle to get the wish-making prize … however as the eldest, I was a tough competitor. Thank you, PollyWog, and keep that tradition going! I second the WOW–GREAT reading. Um… what time should we be over for dinner? I am FAMISHED as well! Dinner? Around here it could be 6 p.m. or 10 p.m.! But I guess that’s the stuff that keeps life interesting. Thanks for your comment, Teresa. This really speaks to me, and in MANY different ways. Then my work here is done. Thanks for the support, Sarzan! We got the stewed rags and buttermilk line all the time, too. Hmm, I wonder why… Love, love, love this blog. Thoughtful, with practical recipes thrown in that people will actually cook. As a kid, whenever I asked Mom what we were having for dinner, she’d reply with a little smirk, “Stewed rags and buttermilk.” It stuck with me all these years. Thank you for the nice comments! I mean, who doesn’t love a good roast chicken?